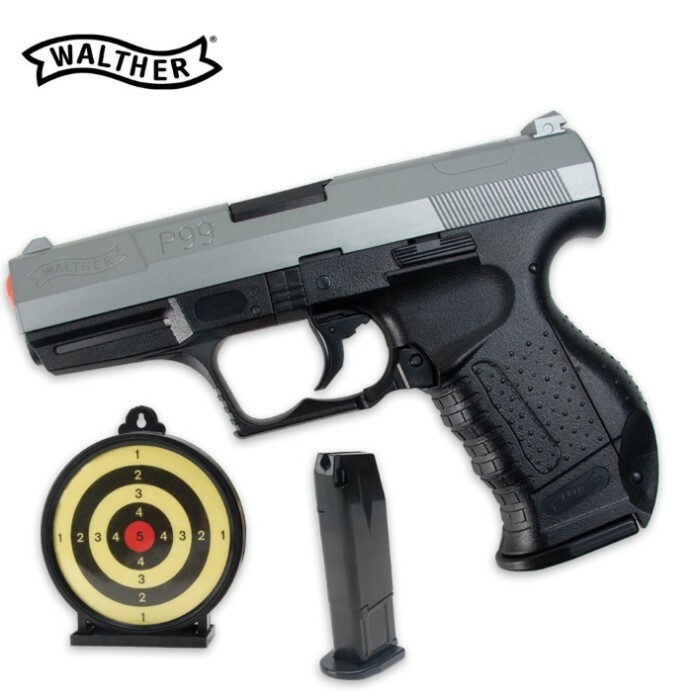 Walther Special Operations P99 Bicolor Airsoft Pistol | BUDK.com - Knives & Swords At The Lowest Prices! Get ready to shoot with this authentic Walther P99 replica, complete with a metal barrel and heavy magazine! I got the Walthers P99 a week ago. A fine pistol. I received this spring operated Walther P99 for Christmas as my first airsoft pistol. Overall, it's good enough for me. Some problems I have with it are: the barrel is loose and slides a little, but does not affect it's performance; the slide does get caught on the slide lock every couple times; and my biggest issue is that sometimes it doesn't shoot a BB. After listing these issues, I still like the look and feel of the pistol. Accuracy is pretty good as well. It's a good gun for a beginner, plus it comes with a nice sticky gel target.